Hey can anyone help me with this? :), my hud doesnt allow me to change my team name to more then 5 letters anyone know how i can change this? DamnEasyHey can anyone help me with this? :), my hud doesnt allow me to change my team name to more then 5 letters anyone know how i can change this? Pretty sure it's supposed to be this way, I don't think It's hud related. Hatim DamnEasyHey can anyone help me with this? :), my hud doesnt allow me to change my team name to more then 5 letters anyone know how i can change this? Pretty sure it's supposed to be this way, I don't think It's hud related. The actual limit is 6. You can't get it any further than that. Find "TournamentNameEdit", and within that, find "maxchars" and change the value from "5" to "6". Find [b]"TournamentNameEdit"[/b], and within that, find [b]"maxchars" and change the value from "5" to "6"[/b]. How do I add the matchmaking ui to m0rehud 2015? I would like to be able to see it when it comes out. how to remove black bg on 2nd screenshot? CT90How do I add the matchmaking ui to m0rehud 2015? I would like to be able to see it when it comes out. is not there? Does anyone know what files I need to edit to fix this? Any help would be appreciated, I have reinstalled the surface_medium font many times by deleting it from Windows\Fonts but it remains unchanged. Can the font, textcolor, border etc. of the cycling add container in the main menu be edited? Make sure that surface_medium.otf is being referenced properly in clientscheme, as in check it's in a font folder if specified, or not in one if that's how it is defined. Probably gonna word this wrong and make it seem more complicated but bear with me. Relating to what spammy asked about on the page before on post #2124 (Recommend you have a quick glance at it to know wtf I'm talking about), I want to make it so the black background in the target id of the bottom image covers the ubercharge %, and I also want to add that target id into the hud in the first image to replace it's target id. Probably not that difficult, but I need help - I can't even figure out how to make the black background larger or anything. EDIT: Figured it out, probably didn't do it very well, but it's done. [s]Probably gonna word this wrong and make it seem more complicated but bear with me. Is there anything I can do about the overheal thingy overlapping with the target id? STOGEIs there anything I can do about the overheal thingy overlapping with the target id? Change the position of one of them, change the size of the cross, change the zpos of hudplayerhealth to be lower than the targetid. [quote=STOGE]Is there anything I can do about the overheal thingy overlapping with the target id? When deleting an item from the backpack a popup confirmation menu appears, what file controls this popup panel? 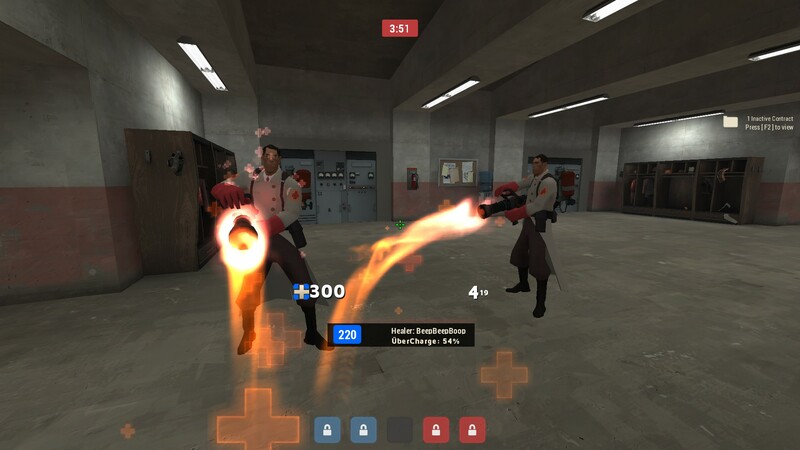 Scripts > hudanimations_tf, search for Health Bonus Pulse and change the PlayerStatusHealthValueshadow color and PlayerStatusHealthValueTarget if you want to change the target buffed health color as well. Stochast1cWhen deleting an item from the backpack a popup confirmation menu appears, what file controls this popup panel? After going through that file I'm very confident that it only controls the notifications that appears when you have a full backpack and receive an item. Go into Team Fortress 2\hl2\resource\ui\econ and grab confirmdialog.res and messageboxdialog.res and put them in your custom HUDs resource\ui\econ folder, then edit them from there. confirmdialog.res is the one you want, the other one is just useful for other dialogs. #2150, this has not been the first time the file I need has been in hl2/. Is there a resource anywhere that goes over what these files do in tf2 (ala doodle) or will I just have to use context clues for the future? Somewhat unrelated to hud editing, but the itemdiscardpanel.res (full backpack panel) can be closed with Alt+F4 so you don't have to discard any items and can deal with it later by trading/filling fabricators/chemistry sets. Somewhat unrelated to hud editing, but the [i]itemdiscardpanel.res[/i] (full backpack panel) can be closed with Alt+F4 so you don't have to discard any items and can deal with it later by trading/filling fabricators/chemistry sets. Stochast1c#2150, this has not been the first time the file I need has been in hl2/. Is there a resource anywhere that goes over what these files do in tf2 (ala doodle) or will I just have to use context clues for the future? There's not too many files in hl2 that are useful for the tf2 HUD, but just assume that if you can't find something in the tf/resource folders, look in hl2. I've been thinking of making a guide similar to doodles for huds.tf, I probably should. How do i change the size of my health and ammo, i'm using m0rehud. AvaHow do i change the size of my health and ammo, i'm using m0rehud. For the health go to HudPlayerHealth.res anche change the font size of PlayerStatusHealthValue and Shadow, for the ammo is HudAmmoWeapons.res. You need to change AmmoInClip, AmmoInReserve, AmmoNoClip fonts. Hypnotize AvaHow do i change the size of my health and ammo, i'm using m0rehud. Hey guys, I'm using notoHUD, how to change the main menu background? 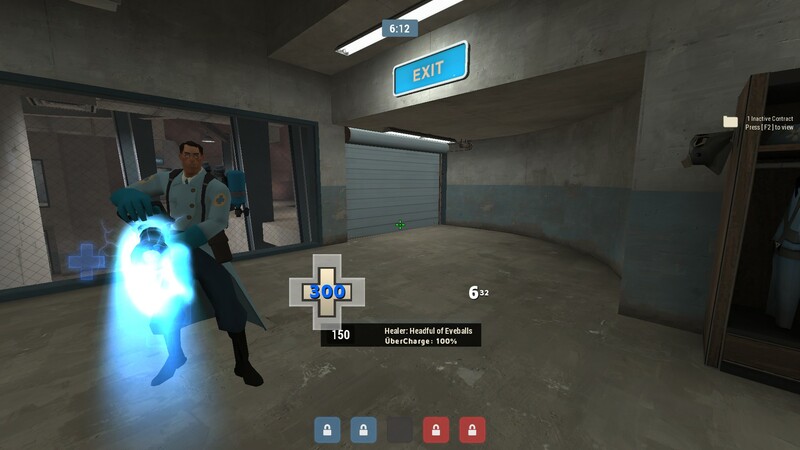 what's the file in resource/ui that controls the taunt menu? How do I remove this halloween wallpaper from main menu?